MnTAP has developed the following resources and included a list of associations to help your facility learn more about, evaluate, and implement pollution prevention and energy efficiency strategies. Fact Sheet: Aqueous Parts Washers for Small Operations (2009). Aqueous parts washers use water-based chemistries and can be less hazardous to operate than petroleum solvent parts washers. Reference List: Aqueous Cleaning Equipment Manufacturers (2004). Aqueous cleaning equipment suppliers offer a wide range of cleaning equipment and related accessories. Fact Sheet Series: Get It Plated Right. This fact sheet series helps you learn more about making sure your parts are ready for plating or other coatings. Intern Summary: Marathon Ashland Petroleum to Save $39,000 through Cleaning Changes (1998). The company eliminated almost all chlorinated aerosol spray use, purchased parts washers with fine filtration to replace four rental washers, and found alternatives to a terpene-based, large surface spray cleaner. Intern Summary: American Converters Eliminates Methylene Chloride Based Adhesives (1997). The facility was able to reduce their regulatory burden by making the switch. Intern Summary: Aqueous Alternatives for Cleaning Measurement Instrumentation (1993). Rosemount Aerospace wanted to find alternative cleaning systems to TCA and CFC-113 degreasing due to the 1990 Clean Air Act. Case Study: Petroleum Solvents and Production Changes Replace Chlorinated Cleaning Solvents (2007). To eliminate 1,1,1-trichloroethane and CFC-113, Windings, Inc. took steps to eliminated 1,1,1-trichloroethane and CFC-113. The process changes the company made apply to other chlorinated solvents like trichloroethylene (TCE), methylene chloride and perchloroethylene (perc). Fact Sheet: Selecting a Still for On-site Solvent Recycling (2011). Become better prepared to select the right still for your on-site solvent recycling. Reference List: Solvent Recycling Equipment (2005). Many solvents can be reprocessed and recycled for reuse. Distillation is the most common method, but filtration can also be used. Reference List: Alternative Solvent Degreasers (2008). This list provides information about degreasing and cleaning solvents that are alternatives to halogenated solvents. Case Study: Metal Stamping Company Saves $26,000 by Eliminating Vapor Degreasing (2007). Dayton Rogers Manufacturing Company used a strategic deburring process to replace trichlorethane vapor degreasing. Fact Sheet: Reducing Solvent Emissions from Vapor Degreasers (2011). Strategies for reducing solvent emissions include drag-out, drafts, diffusion, and sprays. Fact Sheet: Coolant Maintenance for Machining Operations (2004). This fact sheet can help guide you in your efforts to develop a coolant maintenance program. Reference List: Coolant Maintenance Equipment and Supplies (2004). Appropriate coolant maintenance programs help keep operations efficient and productive. Source Article: Spotlight on Technology – The PuriGator (pg5). One tramp oil removal system, the PuriGator offered by Solvent Systems International, uses a weir skimmer to vacuum the surface of the metal working fluid tank and remove free oils and other light fluids. Reference List: Centrifuge Equipment and Services (2011). Centrifuges can be used for liquid-solid separation and to separate two immiscible liquids of different densities or molecular weights. Fact Sheet: Non-Contact Cooling Water (2007). There may be opportunities to reduce water use in your facility by reusing water for non-contact cooling. 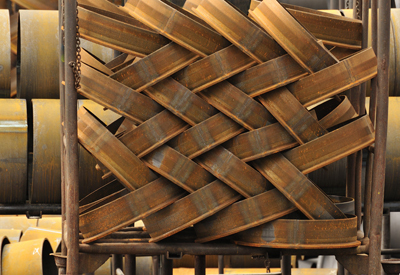 Intern Summary: Recycled Water Cools Welds, Saves Money at Johnson Screens (2011). The company hosed a MnTAP intern to research water and energy conservation opportunities and improve the water recycling system. Intern Summary: McLean Thermal Reduces Water Use, Avoids SAC (2007). McLean Thermal worked with a MnTAP intern to determine the best way to avoid those charges and reduce water and chemical use. Intern Summary: Water Conservation Opportunities at a Printed Circuit Board Manufacturer (1994). An intern at Advanced Circuits evaluated rinsewater flow and made suggestions to save water and money. Source Article: Green team reduces waste, water, and energy (pg2). The green team at Graco evaluated opportunities for reducing waste and energy use. Source Article: Energy efficiency opportunities are available for food processing and metal fabrication facilities (pg4). Highlights energy efficiency opportunities for metal fabrication facilities. At some point, you may need more information or a second opinion on a situation. Take advantage of connecting with others in the machining and metal fabrication industry through associations and training opportunities. Finishing.com: Members of the finishing industry can go here for answers about anodizing, plating, finishing, powder coating and surface finishing problems. National Association of Metal Finishers: NAMF represents custom and job shop surface finishers and suppliers. It is comprised of management executives in the surface finishing industry. Society of Manufacturing Engineers: SME is an international professional society dedicated to serving its members and the manufacturing community through the advancement of professionalism, knowledge, and learning.